We updated the bugs categories and went through all of them to reassign them to the correct category and find no longer valid or duplicate bugs. The immediate result of this is an enormous list of resolved issues in this release. However this is not the main benefit: The change makes it both easier for issue reporters to find an appropriate category as well as for developers to get an overview and find issues relevant to specific parts of the code. The digiKam team was again invited to take part in the Randa Meetings. In this tiny town in the Swiss alps a lot of KDE developers work on improving their software. This years topic is accessibility, meaning make the software usable for as many users as possible, e.g. visual impaired people. Being able to meet team members face-to-face and profit from input of many experienced coders is extremely valuable. Please consider supporting the Randa Meetings to make sure that such events will continue in the future to make our software better. For the digiKam team represented at the event the main focus is on incorporating some of the GSoC projects as the media server dedicated to share collection contents on local network with compatible DLNA devices or applications, as tablets, phones, TV, etc. 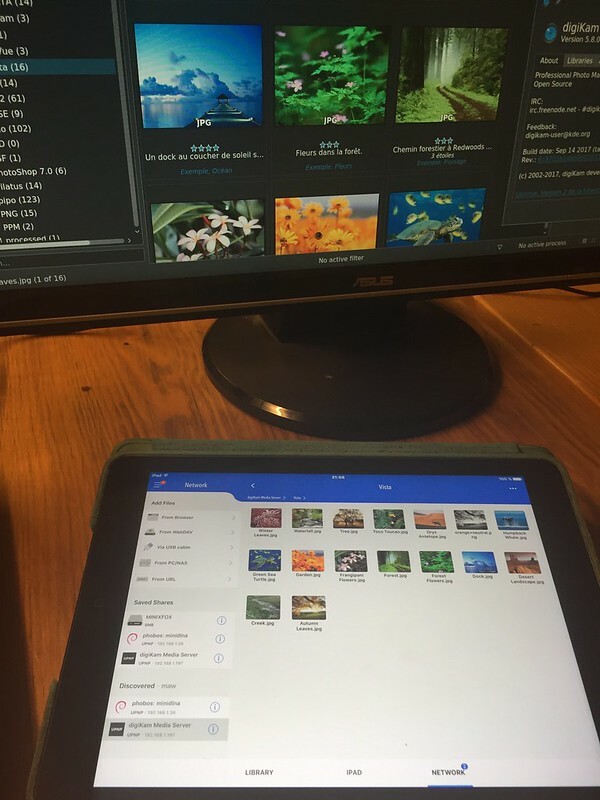 See below a shot of testing session sharing photo with a DLNA application runing on iPad. We already started to incorporate the astonishing work of our Google Summer of Code participants. It will take some time to get it to work as we want and put on the polish - things look promising for the next major release to version 6. The next minor release 5.8.0 will follow towards November. As always, but especially noteworthy this time, you can look at the list of 505 resolved issues for detailed information. digiKam 5.7.0 Software collection source code tarball, Linux 32/64 bits AppImage bundles, MacOS package, and Windows 32/64 bits installers can be downloaded from this repository. Happy digiKaming while capturing lovely autumn colours!